Britain does not inhabit a great deal of reptiles which is mostly because of its cool, damp climate. It does, however, support three types of native British snakes, the Adder, the Grass snake and the Smooth snake. The Adder and the Grass snake are the most common known snakes on the British Isles, however, the Smooth snake is only recognised by very few people. 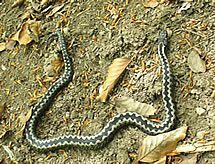 The distribution of these three snakes is quite wide with the Adder being spread all over mainland Britain, the grass snake generally keeping to the warmer regions just below Scotland and down to the South Coast and the smooth snake only found in the Southern Counties. The Adder Snakes (Vipera berus) can be found all over mainland UK, however, they are Scotlands only native snake and cannot be found in Ireland. Scotlands harsh winters demonstrate that Adders are the most capable snake in the world at surviving harsh conditions. Adders do this by hibernating between October and Spring, coming out into the open at different times each year depending on the weather conditions. Adders grow to measure around 90 centimetres in length, however, they are generally smaller, especially where the climate is cooler. Adders have a grey/brown coloured body with a very distinctive black zigzag pattern on their back. Occasionally, adders can be completely black. Female adders are generally lighter in colour with a dark brown zigzag although it can sometimes be difficult to tell the difference. The head of an adder snake is fairly large and distinct, the sides of which are almost flat and vertical. The edge of the snout is usually raised into a low ridge. Their nostrils are situated in a shallow depression within a large nasal scale. Adders eyes are relatively large but often smaller in female adders. The adder diet consists mainly of small mammals, such as mice, voles and shrews, as well as lizards. Sometimes, slow worms are taken and even weasels and moles. Adders feed on amphibians, such as frogs and newts. Birds are also reported to be on the menu, especially nestlings and even eggs, for which they will climb into shrubbery and bushes. Young adders will eat nestling mammals, small amphibians such as frogs, as well as insects, worms and spiders. Once they reach about 30 centimetres in length, their diet begins to resemble that of the adults. Sufficient and suitable habitats are very important requirements for the presence of the adder, in order to support their various behaviours, basking, foraging and hibernation, as well as to offer some protection from predators and human harassment. Adders are found in a variety of habitats, including chalky downs, rocky hillsides, moors, sandy heaths, meadows, rough commons, edges of woods, sunny glades and clearings, bushy slopes and hedgerows, dumps, coastal dunes and stone quarries. Adders will venture into wetlands if dry ground is available nearby. Therefore, they may be found on the banks of streams, lakes and ponds. Although adders have a very wide range of habitats, they tend to prefer open grounds such as moors and grasslands as prey is often abundant. Open grounds are often good places to spot an Adder while out walking or working on the land. Early Springtime is an ideal time to see these creatures particularly if the weather is warm as male adders will be searching for a mate and they can often be seen basking on rocks in the sunshine. The adder snake is mainly a diurnal species, especially in the north of its range. Further south it is said to be active in the evening and it may even be active at night during the summer months. It is predominantly a terrestrial species, although it has been known climb up banks and into low bushes in order to bask or search for prey. The Adder is the only venomous snake in Britain although it very rarely attacks. An Adders usual approach is to use its amazing camouflage to avoid being spotted or to disappear into the bushes and undergrowth quickly if they feel the vibrations of a threat approaching. While the adder is thought to have claimed the lives of around 10 people within the last 100 years or so, modern knowledge about snake bites and good access to medical care have greatly reduced the threat they pose to life. Only those that are susceptible to anaphylactic shock (hypersensitivity allergic reaction in humans and other mammals) are at major risk. The venom of the adder is actually quite strong, however, adders do not inject a large amount at any one time or strike repeatedly as with other venomous snakes making them less risk. Female adders often breed once every two years or even once every three years if the seasons are short and the climate is severe. Pairs stay together for one or two days after mating. Males chase away their rivals and engage in combat. Often, this starts with the flowing behaviour before culminating in the dramatic ‘adder dance’. In this act, the males confront each other, raise up the front part of the body vertically, make swaying movements and attempt to push each other to the ground. This is repeated until one of the two becomes exhausted and crawls off to find another mate. Females usually give birth in August-September, however, sometimes as early as July, or as late as early October. Female adders give birth to between 5 and 20 live young which are around 15 centimetres long at birth. The young are usually born encased in a transparent sac from which they must free themselves. Sometimes, they succeed in freeing themselves from this membrane while still inside the female. The young snakes, measuring around 14 to 23 centimetres, are born with a fully functional venom apparatus and a reserve supply of yolk within their bodies. They shed their skins for the first time within a day or two. The young snakes are immediately left to fend for themselves and go into hibernation quite soon after birth, often not eating until into their second year. 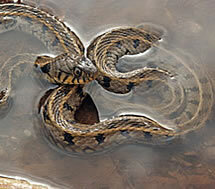 The Adder Snake is listed as protected (Appendix III) under the Berne Convention. The Bern Convention on the Conservation of European Wildlife and Natural Habitats 1979, also known as the Bern Convention (or Berne Convention), came into force on the 1st June 1982. It has now been signed by the 39 member states of the Council of Europe, together with the European Union, Monaco, Burkina Faso, Morocco, Tunisia and Senegal. The Grass snake (Natrix natrix), sometimes called the Ringed Snake or Water Snake, is the largest reptile in Britain. It is the larger of three British Snakes and can be found throughout the southern regions of Britain, generally in areas close to water where it can find its favourite food, frogs and toads. One of the reasons it can survive the British climate is because it hibernates away from October through to March and April, therefore avoiding the times when the sun is at its weakest, allowing the snake to only come out when it can get enough energy from the sun to survive. Male Grass snakes measure up to 90 centimetres in length, female Grass snakes are slightly larger measuring 130 – 190 centimetres. Grass snakes vary in colour but are usually olive-green, however, grey or brown is not unusual. Grass snakes have a characteristic orange or yellow collar around their necks. Their undersides are lighter in colour. The Grass snakes preferred habitat is damp areas like ponds, reservoirs and marshes, also making use of the surrounding terrestrial habitat such as grassland, scrub and woodland. Grass snakes are often found in areas where there are ponds, lakes or slow running rivers where frogs and toads live. Grass snakes are strong swimmers so can easily move through the water looking for prey, sometimes taking small fish or even the odd small mammal. If threatened, Grass snakes may lie still, pretending to be dead, however, they can rear up in mock attack, hissing. They also excrete a foul-smelling substance, particularly if handled, however, they are otherwise completely harmless to man. In warm weather Grass snakes can be seen basking in the sun. Like all snakes, they are cold-blooded and can only be active and hunt when they raise their body temperature in this way. Unlike the adder, Grass Snakes do not have any venom so there is no real risk to humans if you come in contact with one. As with all snakes, they are very shy and will disappear quickly if they feel the vibrations of something approaching. To see a Grass snake you have to be very patient and very quiet around their natural habitat. Due to clearance of large areas traditional woodlands and wild areas, Grass Snake numbers have been drastically reduced in recent years to the point where they are now a vulnerable species. Female Grass snakes mate every other year. Unlike the other native British snakes, they lay eggs and incubate them in their burrows for around 10 – 12 weeks until they hatch in late summer in August or September. The females lay 10 – 40 eggs in June or July. The young Grass snakes are immediately independent, however, very few make it to adult life as they are eaten by a wide range of animals. Destruction of such habitats in peoples gardens is another reason why Grass Snakes, as well as other traditional British animals are on the decline. The Smooth snake (Coronella austriaca) is found in the southern parts of the British Isles. The Smooth Snake has a restricted distribution in the UK and is now thought to be confined to the South East of Dorset, South West Hampshire and a small area of East Hampshire and West Surrey. Males reach a maximum of 60 centimetres, females 68 centimetres in the UK, though adults are smaller in the county of Surrey. Females are slightly larger than males, however, they have shorter tails and are usually uniform silver grey, with distinct spots. The male Smooth snakes colour pattern consists of a brown, grey, reddish colour with two rows of small, dark spots running down the back towards the tail. In some cases, each pair of spots may be united towards the neck area, forming a series of cross-bars over the back. There is also a row of dark spots running along each of the flanks. These spots that run the length of the body overlay four parallel, rather shadowy stripes that also run down the back and flanks. The head of the Smooth snake is somewhat heart-shaped. This shape is where the name Coronella comes from, which means coronet (a small crown). A relatively thick dark stripe extends from the nostril along the side of the head to a little beyond the neck, only being interrupted by the eye. The tongue of the Smooth snake is reddish brown or dark red. The Smooth snake is so named because it lacks the central keels, or ridges on its scales, unlike our native Adder and Grass snake. This adaptation means that it is not as swift as our other snakes, however, it is well suited to navigating dense vegetation. Due to this name, the very smooth Slow worm is often mistaken as being a Smooth snake. Smooth snakes are extremely rare and cautious, spending much of their time under ground. In the UK, the Smooth snake is thought of as a heathland specialist, although it will happily hunt in grassland habitats. The stronghold of the British animals is the heathlands of Dorset, although many of the heaths along the Surrey/Hampshire borders also support strong populations. In Surrey, the Smooth snake shows a marked preference for dry lowland heathland, comprising mosaic mature heather with a deep moss sub-structure to the vegetative layer. Smooth snakes feed mostly on lizards and other reptiles, including small snakes such as young adders and grass snakes. This liking for other cold-blooded creatures means they can never be found in the cooler regions of the UK. They do however take small mammals such as mice, voles and shrews. Smooth snakes kill their prey by stealth rather than speed. They grab their prey with their mouth and use their body in a similar way to a Boa constrictor to squeeze the energy out of the prey before eating it alive. Smooth snakes use this method because they lack the venom to subdue prey with a solitary bite. The Smooth Snake is a non-venomous snake and is exceptionally rare. The rare sightings of the Smooth snake are not helped by the fact that it is easily mistaken with the adder snake at a glance, although it does not have the same distinct solid zigzag appearance on its back. Mid-Spring is a good time to observe Smooth snakes as the males will be looking for mates and may be active during the day, occasionally fighting to secure the rights to a female. Like the other British snakes, the smooth snake hibernates between October to early Spring, often huddling together with other snakes. As soon as the sun is out in Spring and they are able to replenish their energy they are able to mate. Mating occurs from mid March through to May, it has been suggested that the smooth snake may also mate in Autumn. Like the Adder they may only produce young every second year when conditions are unfavourable. A maximum of 15 young are produced after a gestation period of around 90 days. The young are born in a membrane that breaks soon after birth. Young Smooth snakes measure from 14 to 16 centimetres. The top of the head of juveniles is entirely black and the lateral series of spots on the body is more strongly marked. Young Smooth snakes in the UK will only feed on other reptiles, the juveniles taking prey almost their own size. Some Smooth snake have reached an age of almost 30 years in the wild, however, they usually live to the age of 25 years. UK specimens of the Smooth snake have been found to be unsuitable for captive breeding. Conservation is achieved through heathland management and translocations when necessary. Smooth Snakes are protected under the Wildlife and Countryside Act 1981. It is an offence to disturb these snakes in any way, Kill, harm or injure them, Cause damage to their habitat, sell or trade them in any way.